Replacing a chain and sprockets is a relatively involved job, usually pretty messy and takes a bit of time, but it isn't that difficult as long as everything is done in the correct order. The only thing some people fall down on is not having a chain breaker/riveter - or not having a very good one. Soft links must be fitted correctly or there's a danger of the chain breaking and taking your foot with it. If you're unsure or lacking in mechanical confidence, take the job to the professionals. Otherwise, read on. If you want a refresher course in rear wheel removal at this point, refer to the maintenance tip in our November issue. If not, get everything you need in one place before you start. This will include your bike, the new chain and sprockets, tools to remove the rear wheel, front sprocket cover and front sprocket (possibly a great big socket), a new front sprocket tab washer (possibly), paddock stand (if you don't have a centrestand) and, unless your bike is of the 500cc-or-less commuting variety and uses a split-link chain, a chain breaker/ sideplate press fitter/riveting tool. Step one is to loosen the rear wheel nut (but leave everything in place) and remove the front sprocket cover. You may have to take the gear lever off to do this. 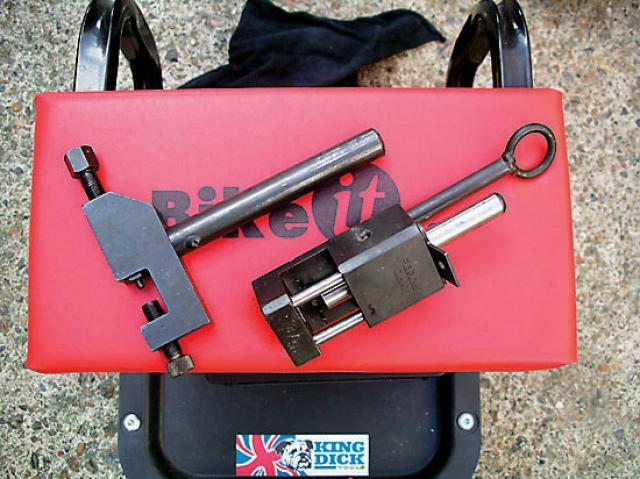 If so, mark the end of the gear shaft and the linkage's clamp so you can reposition it on the shaft's splines in the right place when it comes to refitting. Front sprockets are held on in one of a few ways. The most common is the large central nut and tab washer (seen here on the Ducati SS1000) or a splined flange and mounting nut(s) arrangement. The latter is easy enough to remove, the former a bit trickier. You'll need to flatten the edge of the tab washer to access the nut. You may find the nut is only finger tight once this is done (a bad thing, on the whole), otherwise a big socket and breaker bar is now in order, but you'll need to stop the sprocket turning as it's undone. Professionals will breeze through this with a compressed air-driven power tool. If you don't have one to hand (a professional or his tool), either get a mate to stand on the rear brake (not 'best practice', it has to be said), or block the wheel's spokes against the swingarm with a sturdy piece of wood. That should do it. Get the bike up on its centre stand or a paddock stand. Back the chain adjusters off completely and push the wheel forward so the chain is fully slack. You should now be able to lift the front sprocket clear of its shaft and replace it with the new one. Refit a new tab washer (if applicable) and do the nut up finger tight. Next, remove the rear wheel and support it against a wall, or rest it sprocket-side-up on an old tyre, and undo the sprocket nuts. (Some sprocket holders need to be pulled clear of the wheel in order to remove the sprocket. If so, clamp the sprocket in a vice to hold it steady while undoing its retaining nuts.) Remove the sprocket, have a bit of a clean up and fit the new one, using a thread-locking compound and the correct torque settings. Refit the rear wheel, but don't tighten anything up yet. Chain breaking time. The breaking can be done with an angle grinder, if you're a bit of a butcher, but a proper tool is best and a decent quality one (read 'expensive') is a sound investment. The one used in the pictures is a professional quality item from Regina, the chain people. However, Motrax ((01933) 418415 or www.motrax.co.uk) make a reasonable all-in-one breaking/press fitting/riveting tool for £49.99, MPS ((08707) 777333 or www.thefastone.co.uk) do a chain breaker for around £20. Others are available, but whichever you use read the instructions carefully. If you are using a cheaper breaking tool it's wise to take a file to the flattened rivet heads before pushing them through. It gives the tool an easier time. With the chain split, temporarily attach one end of it to an end of the new chain, and use the old one to pull the new into position. 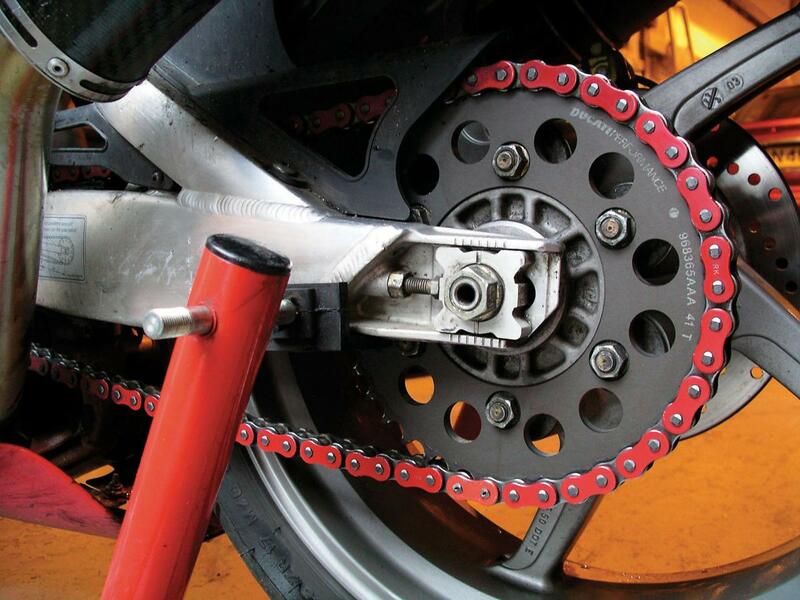 Keep it under tension at all times so the new chain doesn't drag through all the crud around the swingarm pivot and behind the front sprocket cover, and keep the new chain clear of the ground by resting it on some old newspapers or clean rags. Fit the new chain's joining link. Small capacity bikes will have an easy-to-fit split link with a spring clip to keep it fastened. Easy enough to do; put a bit of grease on and make sure the spring clip's closed end faces the direction the chain runs in, then snap it into place with pliers. Bigger bikes will have heavy duty soft rivet joining links which need the pins' ends riveting into place to permanently fix the link together. They are absolutely essential on powerful bikes, which can easily snap a spring-clip type link at the twist of a throttle. If it's an 'O'-ring chain fit one pair of 'O'-rings in place on the link's pins, grease it all up and then use it to hold both ends of the chain together. Fit the remaining 'O'-rings to the protruding rivet pins. The sideplate itself may be an interference fit. Some breaking/riveting tools come with a sideplate press-fitter. If not, it can be carefully eased into place with mole grips. Squeeze with the grips over one pin at a time, and only a tiny amount at a time so as not to bend anything. Once the pins start to protrude, place washers over their ends so the grips still squeeze the plate into place, rather than clamp against the pins. Check as you go that the sideplate is going on square, not wonky. Once it's on, the pins' heads need riveting to hold it in place. Blacksmiths and engineering apprentices will knock them into shape with three or four deft blows from a ball pein hammer, using another hammer held in place behind as a miniature anvil. The rest of us will have to use a bespoke chain riveting tool. Again, read, understand and follow the instructions supplied with it as they may differ from tool-to-tool. Now we're on the home straight. Take the bike off its centre/paddock stand and fully tighten the front sprocket using whatever technique was employed in its removal to stop the sprocket turning, and apply a threadlocking compound for added security. Lock the new tab washer in place and refit the sprocket cover and gear lever (where necessary). Back at the back, adjust the chain to the correct tension and tighten everything up. Give the new chain a squirt of lube and we're done. Street legal ZZR1400 clocks 215mph!